But that isn’t quite enough. So Izzy also starts baking her special double chocolate brownies with gooey caramel chunks. When the people realize they’ve been burgled, at least they will have a nice, tidy house with no chores to do and something sweet to eat. But that isn’t quite enough either. Will Izzy ever find a way to get rid of this funny feeling she gets every time she has to steal? Will she find a way to be a good burglar and a good person, too? Readers will fall in love with this little troublemaker with a very big heart. A sweet picture book with an important message about doing what's right and not giving in to peer pressure for children ages 3 to 6. Amy Proud has a degree in fine art. While teaching at an elementary school, she quickly realized that making children’s books was what she was meant to do. She resides in Northampton, England. Izzy the Very Bad Burglar by Amy Proud is an incredibly fun book for kids! My kids absolutely fell in love with this little troublemaker with a very big heart. Izzy comes from a family of burglars but gets a funny feeling in her tummy whenever she steals. To make up for stealing she begins tidying up and baking brownies at the homes that she steals something from but that isn’t quite enough to get rid of the funny feeling in her tummy. Will she find a way to be a good burglar and a good person, too? This is such a fun book and the illustrations throughout the book are beautiful. 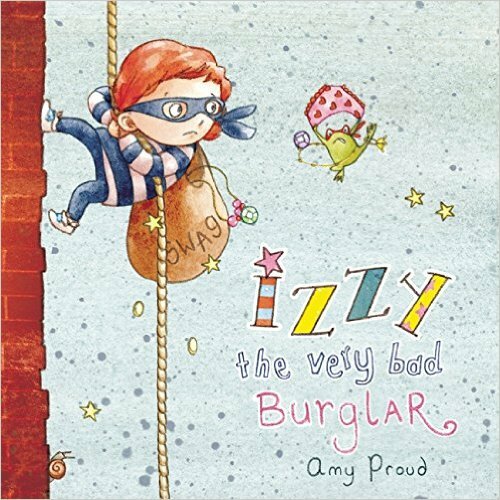 Izzy the Very Bad Burglar by Amy Proud is a wonderful book for kids and I highly recommend it! You can find Izzy the Very Bad Burglar by Amy Proud on Amazon, Barnes and Noble and other bookstores.